As usual I bought far too much from the farmers market. When I can I go early and I managed it despite having been at the CAPA Life of Brian the night before. It was already crowded at 8am, with more vendors than usual and a more diverse group of shoppers. Luckily I rode my bike or else I might have bought even more. I tend to operate on the basis of cook it and they will come, or else it might just be that my eyes are bigger than my stomach. But when the produce is so fantastic who can resist? Some of the gems I found yesterday were methany plums, (small round and addictive they have been fantastic for several weeks), shitake mushrooms, white peaches, five different types of summer squash including beautiful pale green lebanese zucchini, baby eggplants (they were so adorable I couldn’t leave them) delicate young arugula and blackberries. I also bought a rather intriguing yellow cucumber that I never seen before. I think the only thing I did resist were the local apricots which have been a recent treat. 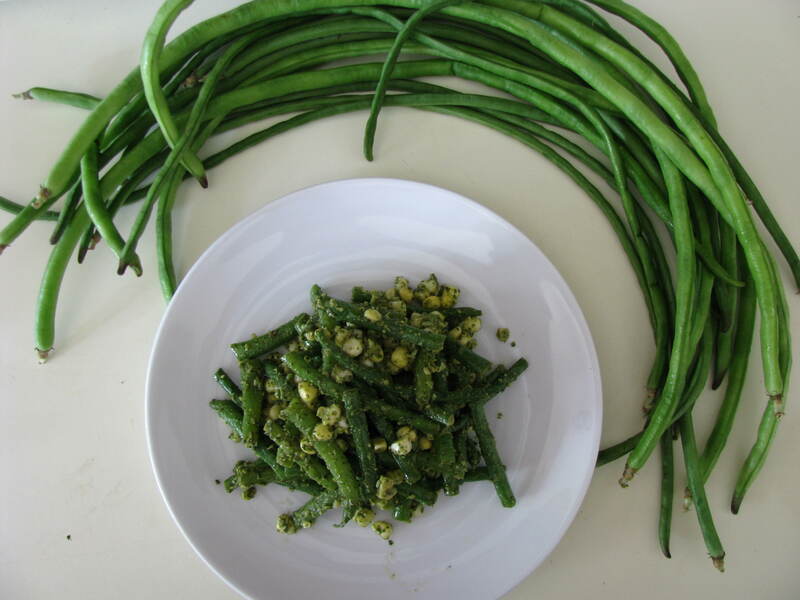 The long beans are from Toad Hill Organic Farm, one of my favorite stands at the North Market. Earlier in the season I couldn’t get enough of their Bok Choy. I also got some heirloom zucchini there this week. The beans were steamed and then cooled on a kitchen towel on top of a baking sheet, instead of shocking them, a method I borrowed from Peter Berley in the Flexitarian Table. It works really well. The corn is bicolor and really tender. I cut it straight off the cob. The pesto is an adaptation of basil-cilantro pesto from Veganomicon, with walnuts instead of almonds. Today I served the corn and beans with a Zucchini Frittata, adapted from 101 cookbooks, homemade whole wheat bread and a green salad. Now I have to work out what to make with the rest of those zucchini. I planted those yardlong green beans this year and they are just beginning to flower. Were they tasty? They were delicious, but they cooked very quickly so be careful. I steamed them and they only needed a couple of minutes. I had the rest of them this evening and they were really moreish.